Coach & Bus Live may be the smaller of the two Birmingham based shows and not attract a full compliment of bus and coach manufacturers but it is nevertheless a big draw to the UK’s bus and coach operators giving them the opportunity to see a wide selection of bus, coach and midicoach models in a short space of time as well as hundreds of related parts and service suppliers. 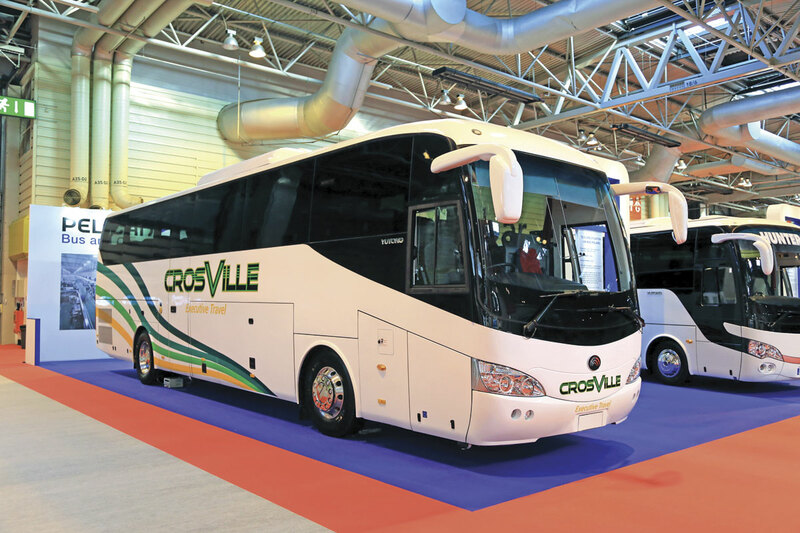 The Bus & Coach Buyer team was there in force to cover the exhibits so we have split this review into three parts covering large vehicles, mini/midi vehicles and products and services. If the coverage given to some leading manufacturers seems greater than that afforded to others this is largely because a number of organisations held press events in advance that we have already covered in some depth. Although I’m approaching this review alphabetically, ADL’s stand is a most appropriate place to start because the Enviro400H City, unveiled on the first morning of the event, was undeniably the star of the show. 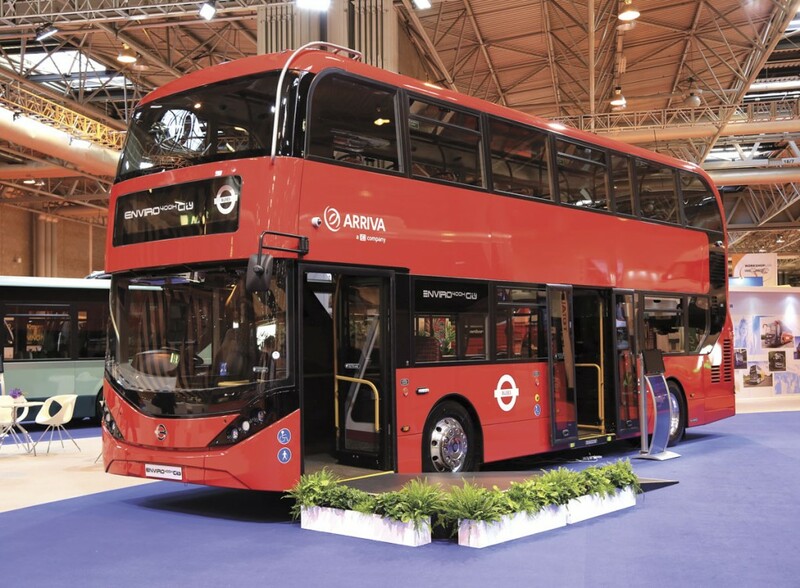 Based on the existing ADL Enviro400 hybrid platform, the 10.4m long Enviro400H City answers a challenge from TfL to produce a product with the aesthetic appeal of the New Routemaster. It has an asymmetric front, a more radiused back and a diagonally glazed staircase amongst its features, together with a more pronounced front dome that meets TfLs wish that customers should be able to see more red on a bus when it is coming toward them. 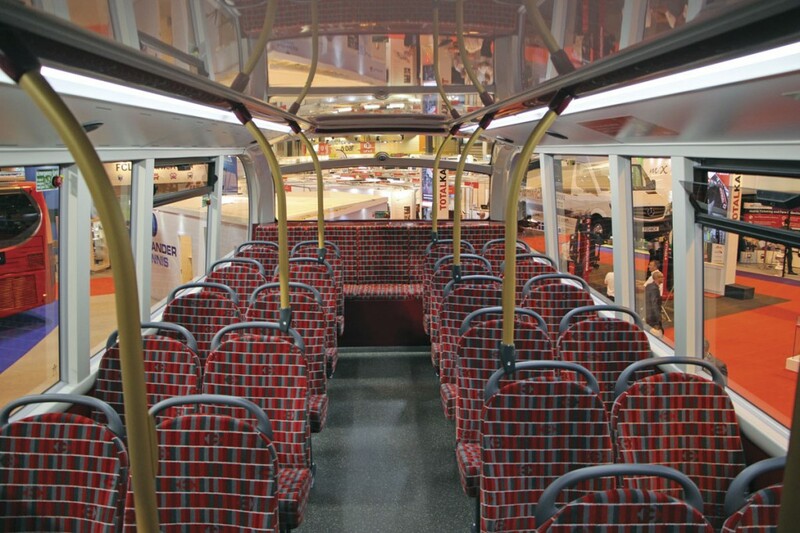 I was shown around the bus and was hugely impressed, especially with the top deck which, with large side windows, radiused wrapover rear ‘SkyView’ window, a ceiling surface designed to reflect light into the interior and a new styling line around the ceiling makes it a very attractive environment, further helped by a new design of moquette developed for use in London and subtly incorporating the LT roundel, that looks both attractive and practical. The seats used were the Esteban Civic V2 unit. Underneath the engine flap, I liked the way that the layout had been rearranged to locate the high voltage cabling behind a cover, though this can be easily removed for access if necessary. Most of the side glazing, with the exception of the first and last bays, is common with existing E400 and also employs the patented QRG quick replacement system. Overall the bus enjoys 95% commonality with the standard MMC version of the Enviro400. The cab featured a new more aesthetic coach-style signalling window that may be made available on other models. I understand there is a price premium over the standard E400 MMC of around 5%. Shown in the colours of Arriva London, who have ordered 19 examples to be based at Ash Grove depot for use on the 78, the bus displayed is to be a demonstration unit that will tour the different London operators. It was built in the Larbert prototype facility and painted at Falkirk. One of the first vehicles will incorporate the 5,000th BAE Hybridrive system to go into service around the world and takes the number of hybrids built by ADL to close to the 900 mark. 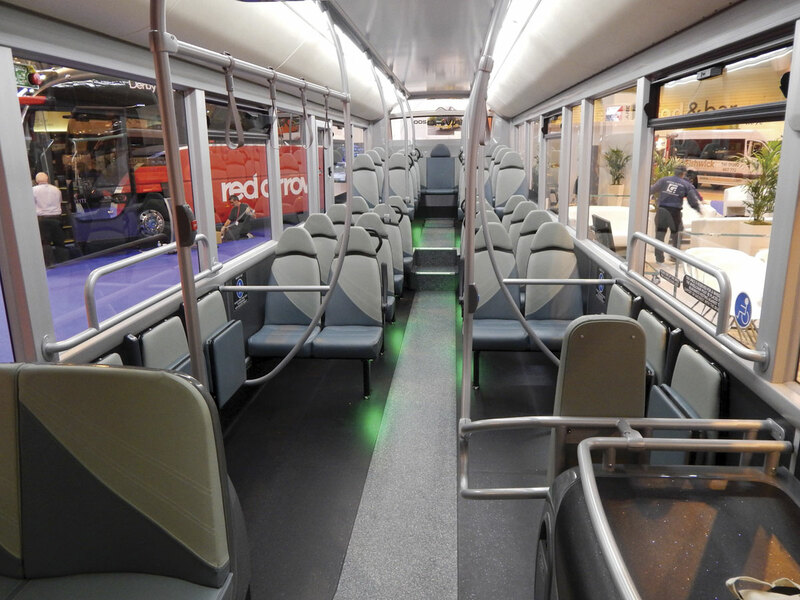 Mike Weston, TfL’s Director of Buses, commented, ‘I’m really pleased, it looks good.’ Asked whether the interior look was now standard for London, he indicated that a view on this had not yet been taken. It would depend how well received it was on whether it was rolled out further. He was cautious about being too prescriptive because, ‘we are conscious about specifying something that can be cascaded later.’ Mike added, ‘Operators don’t yet have to buy this version but I’m not saying that we won’t be encouraging people to look at up-specifed buses’. This is by no means the only innovation that ADL is about to put into London, as November will see the first Virtual Electric double decks, built in conjunction with BAE, enter service. 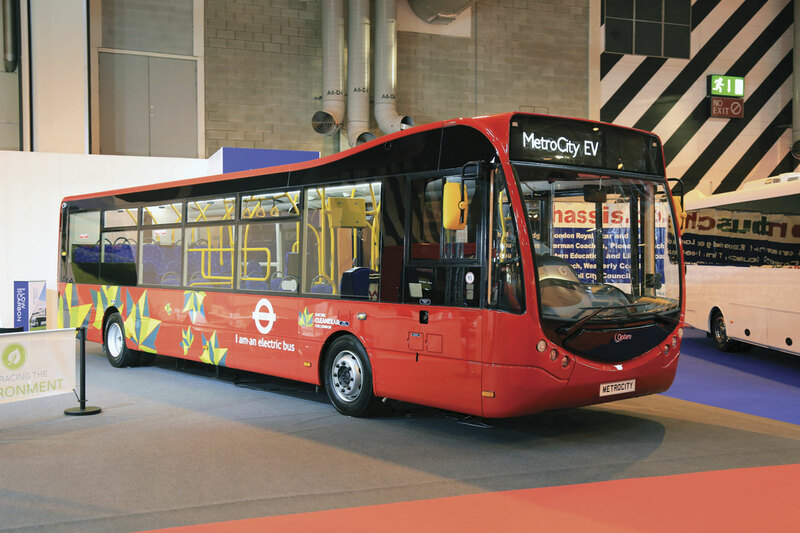 ADL is also working with BYD to provide the bodywork on the single deck full electric buses it is supplying for TfL contracts. Also on the stand was the latest Enviro200 single deck design which was shown in 11.5m format with four-cylinder Cummins engine (the six-cylinder is slightly longer at 11.8m). This had an interior styled in conjunction with Ray Stenning of Best Impressions who had also designed the exterior livery used for it and other demonstration buses to follow. In the demonstration park, ADL showed one of the platinum specification Enviro400 MMC double deckers for National Express West Midlands. The ADL team under CEO, Colin Robertson, were very upbeat, and well they might be as Colin announced a record year in terms of output, turnover, profitability and both product and technology developments. Although it will retain UK market leadership with a 12 month average market share of 46%, ADL will nevertheless see half of the record turnover of £600m derived from overseas. Sales & Aftermarket Director, Arthur Whiteside celebrated his 65th birthday on the first day but has no intention of retiring, though this was the last show for former Corporate Affairs Director, Bill Simpson, who is retiring. Some of the highlights of an impressive barrage of overseas news are the winning of an order for 19 Enviro500 tri-axle double deckers for the Swiss Postbus organisation, a notable first for the company, with a demonstration vehicle about to go into service in Berlin where BVG is tendering for new double deckers. In North America, an 83-seat new version of the Enviro500 called the SuperLo has been developed that is the lowest decker ADL has ever offered at only 12ft 10inches high. A three inch reduction in the chassis height means that it is retains the same upper deck headroom as the 13ft 6in model. The vehicles will be built at a new 45,000 sq ft factory in Toronto with the first SuperLo deliveries scheduled in Q3 2016. In New Zealand lobbying on the benefit of double deck has convinced the authorities to relax the regulations, enabling an order for 39 E500s to be won which will have bodies built locally by Kiwi Bus. On top of this 900 Enviro500s will be delivered to Hong Kong this year, taking to over 2,000 the number of the latest Enviro500 model sold there. Representing the Plaxton side of the business were a Cheetah mounted on an Atego 12 tonne chassis and one of a batch of nine 14.0m long Elites on Volvo B11R 6×2 chassis for use on trentbarton’s Red Arrow services from 25 October, from which date the service will run between Nottingham and Derby (and not on to Chesterfield). The Elite featured the PLS Magic Lift entrance arrangement in order to provide a turn up and ride service for wheelchair users and also has cycle racks in the locker area for five cycles. MD, Jeff Counsell, who happened to be showing someone else the coach when I was on it, was pleased with the cycle feature saying, ‘It’s great that Plaxton could do something with us on that.’ He added, ‘We looked at the interedeck (Elite-i) but this is the best option.’ It is the first time the company has bought Plaxton coaches since the mid 1990s. 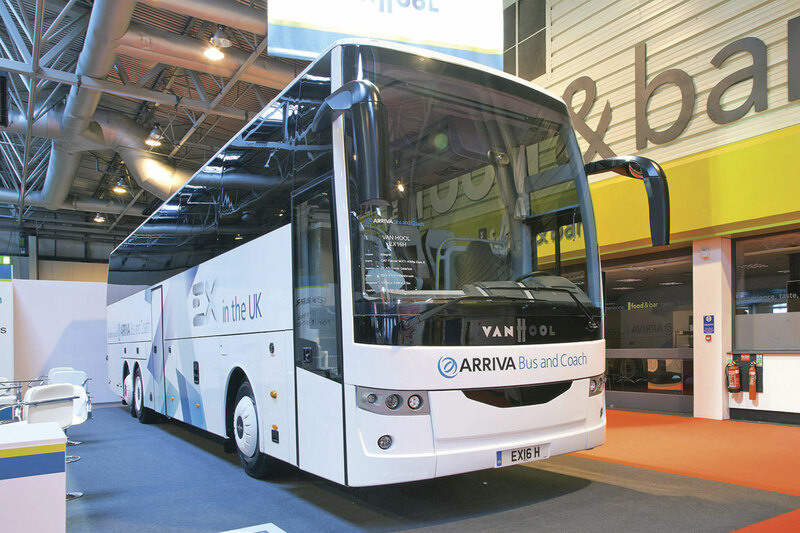 All three of the coaches on Arriva’s stand were making their UK debuts though the company has longstanding links with both the Belgian Van Hool and the Turkish Temsa concerns. Arriva has offered the TX range since it was launched and before that the T9 and T8 ranges but on the stand was a completely new Van Hool proposition in the shape of the EX integral family, built at a completely new factory in Macedonia and which Arriva will sell exclusively while continuing to offer the TX. A right hand drive example was anticipated but we will now have to wait until Busworld in Kortrijk to see that and in its place was a left hand drive version of the 13.385m long, 3.805m high tri-axle EX16H. With a main wheelbase of 6.16m and a rear overhang of 3.035m, it offers a maximum capacity of 57 plus driver and courier, though it will be offered as 53+1+1 as standard with 55+1+1 an option. The luggage capacity is 9.9cubic metres and the driveline combines the DAF MX11.320 435hp engine with the ZF EcoLife fully automatic transmission (though the vehicle displayed was a manual). Arriva MD, Steve Hodkinson, said that the EX range would be focused on three-axle models initially, with the choice of the EX16H or the EX17H. The two-axle EX variants will not be made available yet. He confirmed that there were no pre-orders because people wanted to see what they looked like first, but the reaction had been overwhelmingly positive. A 13.2m Van Hool Altano TX17 with 57 recliners and a 14.9cubic metre luggage hold was also exhibited in the demonstration park. A new option that can be offered is a Euro6 TX16 Alicron two-axle coach with 53 Kiel seats and a chemical toilet. We were teased with the MD9 midicoach quite a few years ago and though one was exhibited in left hand drive it never reached our shores. Now it has. It is 9.38m long with a 4.6m wheelbase, an overall width of 2.4m and a maximum height of 3.327m. Two different seating options are offered. They are the MD9 Executive with 34 recliners with a rear offside saloon toilet and the MD9 Max with 39 recliners and no toilet. Luggage capacity within the central hold is five cubic metres. The continental exit with stairwell is on the UK nearside at the rear which does make the rearmost double a little isolated on toilet equipped examples. The driveline package features a rear mounted Euro6 Cummins ISB6.7 unit rated at 280hp along with the ZF EcoLife six-speed fully automatic gearbox. It has the ZF RL55EC independent front axle and the Daimler HO4 rear axle as well as disc brakes all round, a 280-litre fuel tank and 19.5 inch wheels shod with 265/70R tyres. At a retail price of £150-160,000 depending on specification, it looks a lot of coach for the money. Already, 13 of an initial batch of 15 have been sold and more are on order. Also new, though apart from the Euro6 engine the changes are minimal, is the 12.2m long Temsa Safari HD12. It is now equipped with the DAF/Paccar MX11 unit rated at 368hp coupled to the ZF EcoLife six-speed fully automatic transmission. The maximum capacity remains 53 seats and toilet and though a couple of small lockers at the rear have been lost with the Euro6 engine installation, it still offers nine cubic metres. The seat itself is a different one, the Iona, and opinion among those operators I spoke to was that it was an attractive replacement. The promise of last year’s BASE stand has certainly come to fruition with acceptance and uptake of both the Barbi and MobiPeople ranges exceeding all expectations in the intervening period. Two Barbi coaches were shown. On the stand was the 13.8m long MAN RR4 mounted Galileo HDH to executive specification with 61 recliners, two wheelchair spaces, 480hp engine and ZF AS-Tronic gearbox. 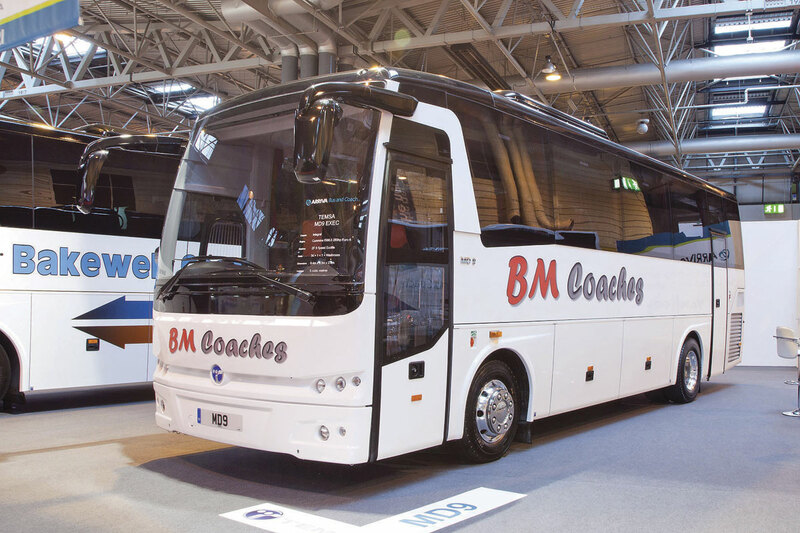 This coach was the subject of a B&CB evaluation (issue 1338, 31 July 2015). 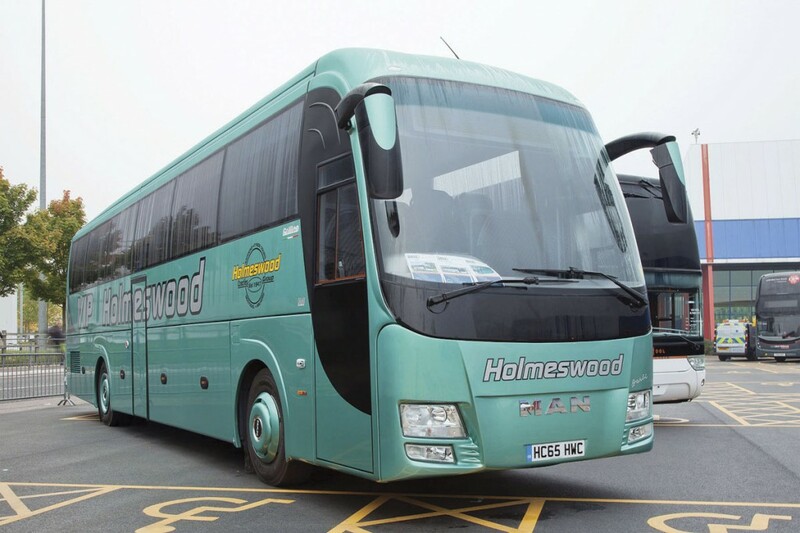 Both it and the latest Barbi option, the 12.4m long Galileo HDL, which was displayed in the coach park, carried the metallic green colours of the Holmeswood fleet. The HDL shown was a 53 seater capable of carrying up to five wheelchairs mounted on an MAN RR2 chassis with 360hp engine and ZF EcoLife full automatic transmission. Two recent Barbi orders are from Atkinsons of Ingleby Arncliffe calling for a 13.8m HDH 61-seat executive and from Anthony’s Travel who are to take a 12.4m HDL 49 seater with a four wheelchair capability. Net prices on the Barbi range are from £201,000 for the 10.35m, from £214,000 for the 12.4m and from £255,000 for the 13.8m though there are options to raise the seat specifications that increase the price. Director, Mark Aspinall, said that it had been good to get confirmation from operators that the design and quality of the vehicle was right as well as the specification. Turning to MobiPeople, there were two exhibits on the stand. The longer of the two was a 70-seat Explorer on an MAN RR8 chassis for KB Coaches of Gloucestershire. This is a repeat order, the first having appeared at the Coach Rally at Alton Towers earlier in the year. 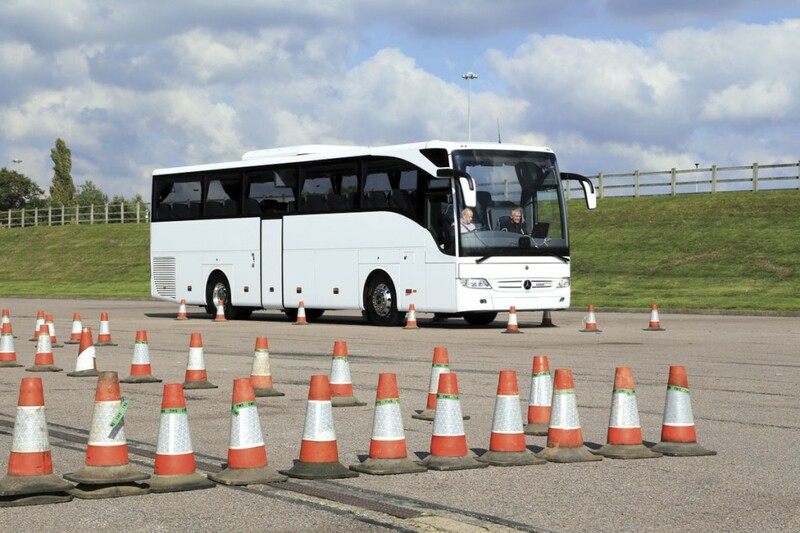 This differed from the earlier coach as it was the first to have the Lane Guard and emergency braking systems that are now standard and will shortly become mandatory. The net price for the Explorer is £162,500. To date 16 Explorers have been sold with all but two 70-seaters, though 59 seats is a no-cost option. The second MobiPeople option (and this should really be in the mini/midi section) is the Midi Explorer on the MAN TGL chassis, nine of which have been sold to date. I initially assumed it was for the Holmeswood fleet but the metallic green was a slightly lighter shade and the lettering on the screen showed that it is for Meadway Travel. 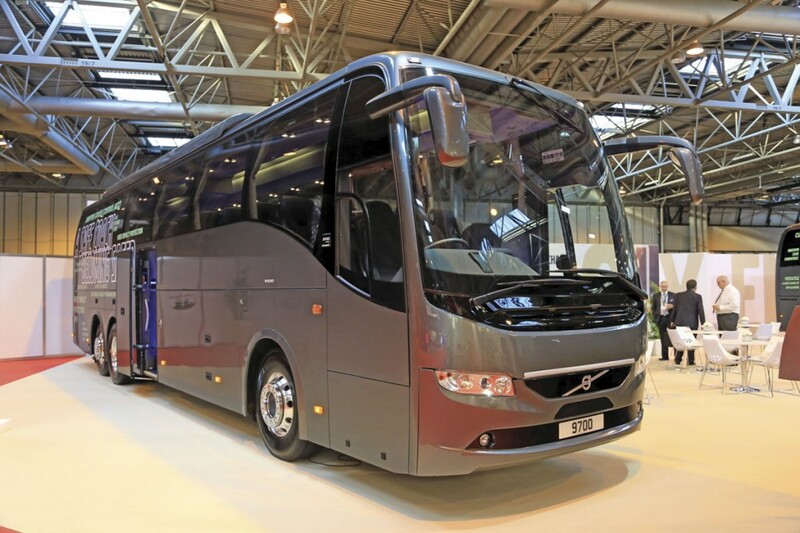 A show deal was being offered on similar 33 seat coaches with leather headrests and piping, air conditioning and double glazing of £120,000 (net) with three year body and chassis warranty in place of the normal two year body and one year full chassis/second year driveline cover. The offer applies to all Midi Explorers sold in October. To date a total of nine have been sold over the past year. 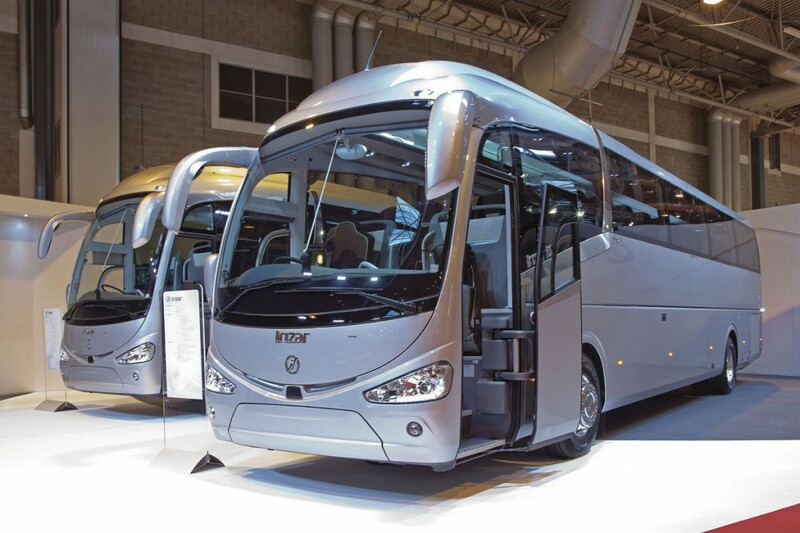 Irizar has been maximising the appeal of the i6 integral range by developing new models, though I am reliably informed that it will be the Irizar stand at Kortrijk that will create the bigger impact with the models on display. Measuring 13.22m long and 3.931m high over the roof hatches, the three-axle MX13-340 with 462hp/2300Nm capacity and ZF AS-Tronic transmission has given the line up increased appeal this year. It was shown with 53 recliners, a comprehensive specification and a luggage hold capable of taking 12.3 cubic metres of luggage. Shorter at 12.92m on two-axles, the second i6 shown had 57 recliners and 9.8 cubic metres of luggage capacity. It featured the DAF MX11-271 unit delivering 368hp and the ZF AS-Tronic 12-speed transmission. The baby of the range, the 10.8m i6 appeared in the demonstration park. This offers 41 new i6 Lux seats and Icomera’s Moovbox WiFi system, enabling passengers to use mobile phones and laptops while on board. It featured the same MX11 driveline as the full length coaches. It had been hoped that this year would herald the appearance of new King Long coach models but these did not materialise and the two large exhibits appeared in the demonstration park. One was the tri-axle XMQ6130Y and the other was an XMQ6127Y, both recently seen at Showbus and emanating from the Bakers of Biddulph fleet. In the halls was the 9.0m XMQ6900. Mercedes-Benz did not have a display within the main exhibition area, save for a single American style schoolbus conversion of a Sprinter 516CDi with 22 seats. Instead, they had a hospitality unit and display outside where as well as displaying six Tourismos of varying specifications, they gave visitors the opportunity to take the wheel of a 51/53-seat touring specification Tourismo with ZF EcoLife transmission, on a demanding course. I did have a go and about the only bit I got right was passing the breathalyser test required beforehand. The Wednesday winner of the Driving Challenge was Jamie Cutting of Logistics Support Ltd, while Thursday’s winner was Zack Yarranton of Yarranton Bros. Both will receive a Mercedes-Benz World AMG Driving Experience voucher. There was one Tourismo in the hall, on the stand of Dawsonrentals. As well as the stock Tourismos EvoBus showed outside, there was one in the colours of Wilfreda Beehive to a full executive specification with 49 leather seats. An interesting new option on right hand drive Tourismo models that is not available in Europe is the new TSE+ seat which sits between the two existing options and enables customers to have two different trim materials on the same seat. Another customer vehicle displayed was the last of a batch of 10 Euro6 Citaro buses for Cardiff featuring Ray Stenning interiors with Mercedes-Benz high back seats, USB connections, reversing cameras and ZF EcoLife transmissions. Another recent Citaro order will see 19 delivered to Go-Ahead London on a full maintenance contract deal. Talking to Sales Director, Marcus Watts, during the event, he said that the company would supply 200 Tourismos this year. He had just concluded another deal with Dawsonrentals for another batch of ten Tourismos for 2016 as well as one with Maynes of Buckie for three. Shearings has just confirmed an order for 46 Tourismos for 2016, which will comprise 16 two-axle 48 seaters with toilets for National Holidays and 30 13m tri-axles for the main Shearings fleet with a mix of 48 and 52-seat plus toilet configurations. They will be delivered between March and May 2016 and displace 45 Setra ComfortClass S415GTHD and 416GTHD models. 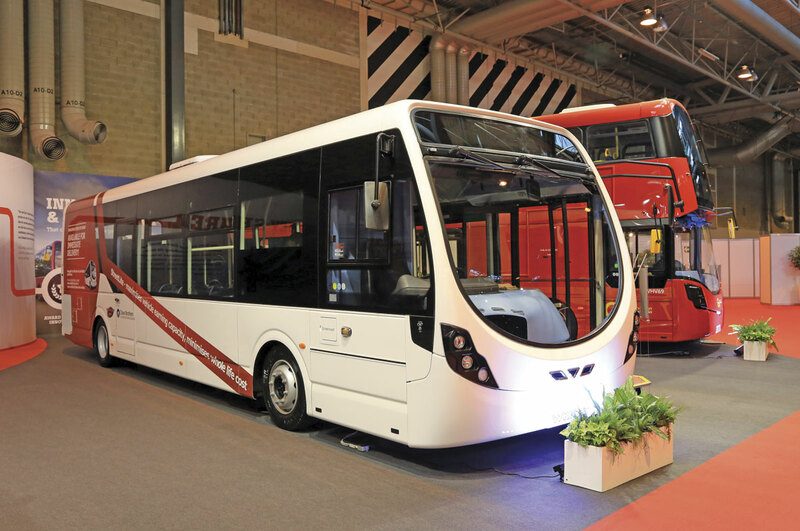 Looking at the line up on the Moseley stand brought home just how varied the portfolio offered now is, providing, as Karl Moseley, MD of Moseley (PCV) explained, from 25 to 96 seats. In the gold of Scotline Tours appeared a VDL Futura FHD2 131/440 with 51/55 recliners and demountable centre toilet. The FHD2 is a tremendously popular model for Moseley who will sell around 70 this year. Orders signed at the show included one for Andy Powell of Sheffield (his second) and a 13.8m to Leger Travel specification for Galleon Travel. This was the first time that Moseley had displayed Beulas product at a major show having taken on the brand matched to MAN chassis a year ago. Mounted on an MAN RR4 26.480 chassis the impressive 13.7m Beulas Mythos, demonstrated the very high quality finish on which Beulas prides itself. It had 59 recliners. The associated Moseley companies are now back on board with the DAF powered Van Hool combination and as a result a Van Hool TDX21 Altano tri-axle was displayed. This had the 13-litre, 460hp Paccar/DAF MX13 unit and ZF AS-Tronic automated transmission. Accommodation was for 63 and a central toilet was fitted. Moseley can supply the Indcar Next on either the 10-tonne or the 12-tonne Atego chassis and the coach displayed was a 10-tonne example being supplied to Apple Coaches with 33 Kiel Avance 2050 recliners. The higher capacity chassis gives greater length and a maximum capacity of 37. Reaction from operators has been good with the first five imported all now sold. Sitcar’s Voyager based on the 7.2-tonne Iveco New Daily 70C17 provides an attractive coachbuilt 25 seater. Shown was an example for Heron Travel of Kendal. Karl Moseley suggested operators should ‘try driving the Voyager Daily’ because ‘it is quiet like a Vario wasn’t’. In the demonstration park were three further coaches, a VDL Synergy double decker for Barnes Travel of Swindon, a Scania mounted Van Hool TX15 Alicron from a pair for Empress of London and a 10.8m MAN RR2 19.360 34-seat Beulas Cygnus for Angela Holidays. Optare is marking 30 years in the business this year and has just won the LowCVT’s ‘Low Carbon Heavy Duty Vehicle Manufacturer of the Year’ title. It has also received a multi million pound funding injection from parent company Ashok Leyland in order to carry out manufacturing improvements, develop the product portfolio, strengthen the aftermarket support network and implement a customer service commitment plan. It celebrated by showing two single deckers; a Euro6 Solo SR and a TfL specification full electric dual door MetroCity EV. The Solo was to the latest specification with smart energy management of the auxiliaries, an auto neutral at stop gearbox feature and electric fans. It has been Low Carbon Vehicle certified and the MetroCity will also be ‘in the coming weeks’ we were told. Plans for the MetroCity include increasing the maximum capacity from 65/66 passengers to over 70. This would be achieved by increasing the capacity of the front axle from 5.5 tonnes to 6.0 tonnes. This would not affect the overall weight ‘very much’. Forthcoming changes available from quarter two of 2016 will see the range of EV models extended from 90 miles to between 130-140 miles courtesy of a new 130kW output option. Outside was the same provincial specification MetroDecker that appeared on the stand last year. It has now gained Yorkshire Tiger colours as it is to embark on in service trials with them for several months following homologation, which is expected to be completed in the coming months. The company hopes to have two MetroDeckers available for demonstrations early in 2016. MD, Enrico Vassallo, explained that a deep engineering revue of the product, which is Optare’s first integral double decker, had been undertaken and some changes to the engine location and installation had been made though there were ‘no major changes’. The latest version weighed slightly over 10 tonnes but work was being done to bring it back below that. Order intake would open in November, he said, with pre-pilot production scheduled for December. The aim was to sell 30-50 units in 2016, all of which would be single door provincial specification 11.5m long examples. In a press conference, much was made of the efforts being made to improve the aftersales experience for customers. Graham Belgum, Aftersales & Business Process Excellence Director, explained that since he had joined from FirstBus in May he had upped the number of Customer Service Managers from three to five to increase direct day to day contact with customers, saying, ‘We want to rebuild the relationship of the past.’ The number of dedicated engineers on the road was also being increased as part of a 40% increase in engineering capacity that would ensure Optare was both attending buses with issues more rapidly and sorting their problems more quickly. The company ‘recognises the need to provide service quickly when people want it,’ he said. It was revealed that there were plans to renew the electric range by the end of 2017 and in doing so Optare would be thinking out of the box. The idea was to design an electric vehicle from the outset rather than adapting a diesel platform. Asked what this might mean in reality Enrico gave the example of the drive axle which was currently a mechanical unit. The second phase of electric development was also focused on the double deck. There were plans to increase international sales using the Ashok Leyland network for support, especially in the Middle East. It was said that changes to the electric platform were also about the internationalisation of the product. Total UK production in 2015 was expected to be around 340 units. The big event on the Volvo stand was Adrian Wickens bowing out on the first day of the show after 42 years. He will be greatly missed and I found myself wondering how he would have been feeling on the second day of the show when he didn’t have to turn up for work. The two vehicles shown were a Sunsundegui SC5 Volvo B8R, a combination that has proved popular beyond Volvo’s expectations, and a 13m Volvo 9700 Volvo B11R equipped with 53/55 Volvo Superior Comfort Plus seats and 460hp engine. It incorporated the new Lane Departure Warning System (LDWS) and Automatic Emergency Braking System (AEBS) equipment necessary from 1 November this year, although, ever safety aware, Volvo have chosen to fit the standard required from 2018 onwards from the outset. The AEBS has a radar beam behind the bumper that detects objects and a camera behind the base of the screen that recognises what they are and whether they are moving or not. When the vehicle is travelling above a certain speed, if the coach gets too close to another vehicle it will apply the brakes to mitigate rather than prevent an accident. LDWS is a warning system that indicates via a vibration in the seat if the coach strays out of lane without the indicators being activated. In the demonstration park were a B8RLE MCV service bus and a Jonckheere JHV B8R coach. As well as a Customcare van (they’re not selling them but they will send one out to sort any issues) Wrightbus had two vehicles on their stand. One was a Streetlite and the other, emphasising the point that 35% of their business is still with Volvo, was a Gemini 3 double decker on a Volvo B5LH hybrid double deck chassis (though the stand details described it as a B5TL). Destined for Go-Ahead London as part of a batch of 39, the B5LH features the latest styling which has now been made standard on all Wrightbus built double deckers whether on their own platform or Volvo’s. Measuring 10.6m long, it seated 61 passengers with a total capacity of 91 and was powered by a four-cylinder Volvo D5K 5.1-litre engine matched to a Volvo I-SAM system. It was handed over to Richard Harrington, Go-Ahead London Engineering Director, during the show. With Wrightbus having taken 750kg out of the body and Volvo 250kg from the chassis the overall weight of the Volvo/Wright combination is a tonne lighter than Euro5 examples at just under 11 tonnes. The single decker was 10.8m Door Forward (DF) model with Mercedes-Benz OM934 Euro6 engine and Voith Diwa6 automatic gearbox. It had a 70 passenger capacity, 41 of them seated. It appeared in a livery promoting Close Brothers Commercial Vehicle Solutions as the two organisations are working closely together with Close Brothers taking examples to various specifications and offering them with a variety of funding options. An example of a Torotrak Flybrid KERS (Kinetic Energy Recovery System) was also displayed, a system Wrightbus is also planning to offer. Sales and Customcare Director, Ian Downie explained that tests were being carried out at Millbrook on a Microhybrid V2 Streetlite with the system and a 10% fuel saving was forecast. Subject to it meeting that savings level it will undergo durability testing with the plan being to offer it in the fourth quarter of 2016. If it does not meet that figure it won’t be offered. For the future, with neither operators nor local authorities clear about what it is they want, Wrightbus will be offering a choice of five different electrical options, though all are effectively based on the StreetDeck platform. These will be: the 10.6m StreetDeck EV with Electrocity Inductive Power Transfer (IPT); the 10.6m StreetDeck EV with Electrocity Fast Charge; the 10.6m StreetDeck EV with Electrocity Range Extender (Euro6 diesel engine); the 10.6m Electrocity Overnight Charge (single deck); and the 10.6m Electrocity with Fast Charge (single deck). Having delivered their first coach in March last year, Pelican Bus & Coach have now registered 75 Chinese built Yutong coaches, of which 40 are the 12.2m long TC12 model. Though the first 21 Euro5 coaches were Cummins powered, all TC12s now have DAF/Paccar MX11 400hp engines and ZF EcoLife fully automatic gearboxes as well as revised and more restrained exterior styling. On the stand was a TC12 for Crosville of Weston super Mare and a further unregistered example of the TC12 in the colours of Sewards of Axminster appeared in the demonstration park. Stock TC12s are currently available and Pelican is about to place an order for more. Sales Director, Ken Grindrod, found it particularly pleasing that many of the orders placed were repeat ones, listing a number of operators including Wheelers Travel, AirLynx Express, MCH, Hamiltons of Uxbridge and Alba Travel who had ordered again after experience of earlier vehicles. The shorter TC9 model, 35 of which have been sold to date, is covered in the mini/midi section of this review issue. A number of other older full sized buses and coaches appeared on the stands of products and services suppliers. These included a very smart AEC Reliance with Plaxton Elite Express III coachwork belonging to Thornes on the Wrightsure stand, an AEC Routemaster promoting Omnibus Passenger Transport Solutions, a Bristol L ECW on the ROSCO stand and an MCV Evolution/Stirling promoting Rowan Telmac. 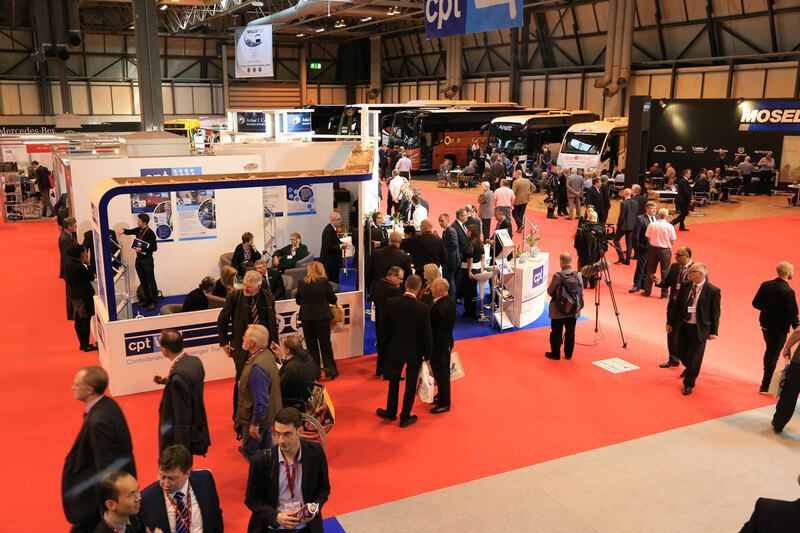 Coach & Bus Live isn’t a vast show but it did attract a high calibre of visitors on both days. My impression from talking to exhibitors is that they saw plenty of people to keep them busy throughout and make the considerable investment in participation worthwhile, though perhaps inevitably there are still questions being asked in some quarters about whether an annual show is really necessary. My personal opinion is that it is well worth attending, both as an operator and an exhibitor, but in the latter case it isn’t me that has to sign off the expenditure.